Aaron Weiss, MD, pictured with Eunice Goetz, PA-C at Emory Clinic in Johns Creek. A new Emory Clinic urology practice is now open to patients at Emory Johns Creek Hospital (EJCH). The practice provides diagnosis and treatments for patients with urologic conditions such as: urologic cancers, kidney stones, male infertility and elevated PSA. "We're excited to expand Emory Clinic Urology services to treat patients in Johns Creek and surrounding communities," says Martin Sanda, MD, chairman and chief of urology at Emory School of Medicine and Emory Healthcare. Emory Urology offers sophisticated, patient-centered care to treat adult urological conditions. 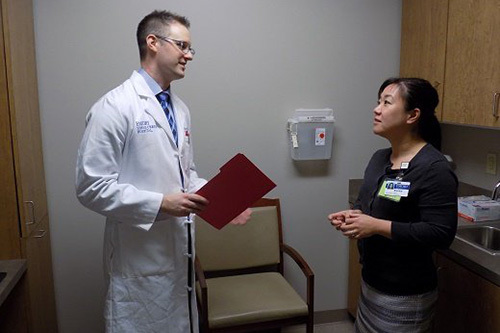 "The Urology Department's physicians bring first-in-class expertise to the entire spectrum of urological care, from kidney stones, to cancer, to men's health, to reconstructive urological procedures for men and women alike," says Sanda. Aaron Weiss, MD, assistant professor in the department of urology at Emory University School of Medicine, is leading the Emory Urology Team at Johns Creek. He describes a key goal of the new urology practice to be greater convenience for patients in the Johns Creek area. "We want to extend the highest quality and breadth of urology care here in Johns Creek that you would receive in the heart of Atlanta," says Weiss. Eunice Goetz, PA-C, says the practice hopes to work closely with Winship Cancer Institute of Emory University doctors and staff at EJCH to treat patients with bladder, kidney and prostate cancer. "Our multidisciplinary approach allows us to better serve patients and provide high-quality patient care with a link to innovative research and clinical trials at Emory School of Medicine," says Goetz. Emory Clinic's Johns Creek urology office includes seven exam rooms. The practice is located at 6300 Hospital Parkway in Suite 145. For more information about urology services at Emory Healthcare, visit www.urology.emory.edu or call (404) 778-4898 to make an appointment.